So, Spot and I headed back to the ‘Mystery River’ for another look-see. I have become more vague about naming such places as I see lazier folk wanting to track me there – someone had visited only the day before, though last time I was there clearly no-one had been there for YEARS. (I will go back over other of my posts to blur the locations somewhat: there ARE trolls!) As a consequence the deer were much ‘spookier’ than previously (no doubt the ‘intruders’ were wearing camo, as it has this effect!) We saw only nine deer – though we heard a lot more; all were either hinds (& fauns) or spikers, though there is much sign of stag activity. I could have taken at least two hinds on the opposite bank of the river but the difficulty of recovering them across an unfordable (winter) river means I can resist temptation – and there was Spot to consider. 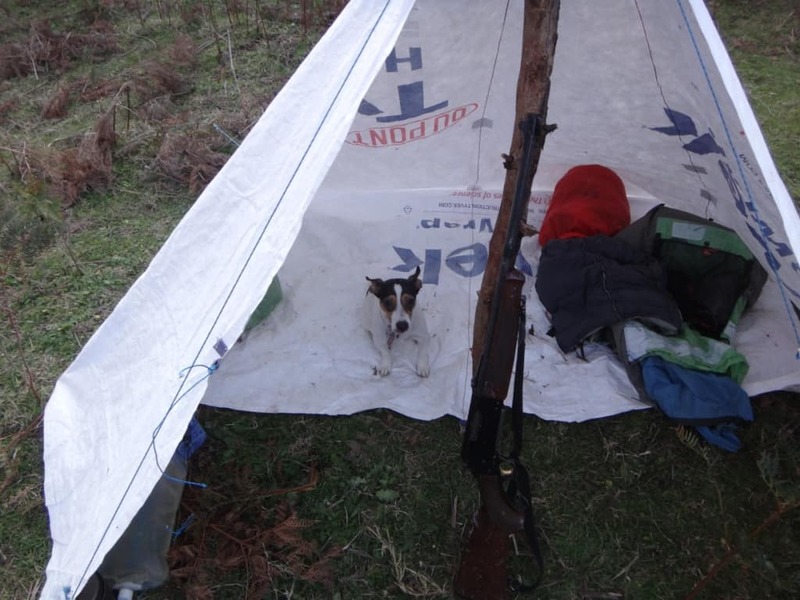 Two on ‘my’ side were chancy shots: I NEVER want to leave a wounded animal to suffer. 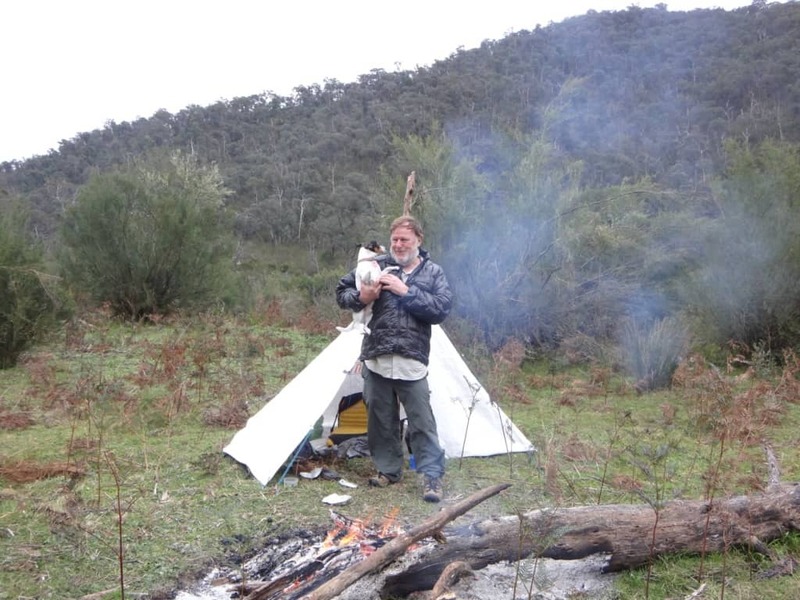 I had made a few minor improvements to my tent (http://www.theultralighthiker.com/tyvek-solo-fire-shelter/), which worked well. I think I will alter the positions (upward ~2”) of the two windward outer tie downs as these were preventing the tent from tautening perfectly on slightly uneven ground. It doesn’t matter, but it would look better. I may tape an extra bit onto the floor to make it wider so one can sit up straighter. I will update the post when I have done this. The additional glue-on tie outs about 1’ up on this side certainly held the fabric further away from us. Between laying the fire and lighting it a couple of hours later (after a quiet stalk) the wind altered its (forecast) direction and instead of blowing NNW was blowing from the South (which I failed to note) so that the smoke was inclined to scoot into the shelter annoyingly. I cured this by closing one of the storm flaps so the smoke just sailed on past. It would have been annoying to have had to move the shelter in the night. Note to self: take more care with forecast and wind direction. Spot is a big help setting up camp! I use a -1C degree Montbell UL Spiral Stretch bag http://www.moontrail.com/montbell-ul-spiral-down-hugger-3-reg.php (624 grams) which is enough for most Victorian conditions. You CAN lower its comfort limit by up to 8C with one of these http://www.seatosummit.com.au/products/liners/thermolite-reactor-liner/ but it adds 248 grams to your pack. I carry a UL Montbell insulated down coat and vest (which together weigh about 400 grams, and a pair of these https://goosefeetgear.com/products/1-down-socks which weigh about 60 grams and instead of a down balaclava (also available there) I have an insulated helmet Della made me from a Rayway kit http://www.rayjardine.com/ray-way/Insulated-Hat-Kit/index.htm which weighs 30 grams. As all of these items add nothing to my packweight as I would need them in camp anyway; if I wear them to bed they reduce the comfort level of the bag by a corresponding amount. (Tip: I wear the vest upside down from approx my knees to my waist). Tip Two: To avoid a cold nose I pull the insulated helmet down to the tip of my nose which works wonderfully. NEVER breathe (or sweat!) into your sleeping bag: moisture rapidly reduces its insulative ability, and you WILL freeze! I found an old packtrack on this trip, but I have not cleared it yet. They are wonderful things. Another elsewhere which I cleared for a distance of over 30kms (and injudiciously informed various ‘friends’ of) has become somewhat of a magnet for hunters who never before hiked and camped out in their lives: I always leave a pile of wood at each of my camps so that if I arrive in camp late I do not have to collect it before dark. It is just common sense and good manners really. There is always a limited number of places which share all the qualities needed: a level spot, out of the wind, near to water, available firewood. 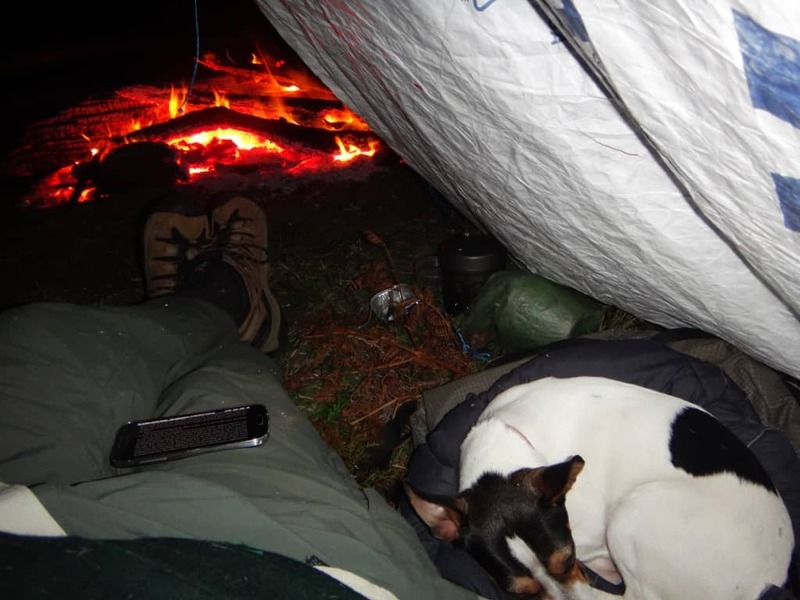 I was annoyed one night to arrive at one of my camps to find two chaps already burning ‘my’ wood quite needlessly (it was a warm enough night no fire was needed). Some people have not understood that one of the chief reasons folk were nomads is that a group quickly depletes the available firewood in an area, requiring that they move on. This situation has become even moreso as a result of the bushfires. I was forced to travel further on to another camp in the twilight. Even though I asked them to replace ‘my’ wood, they did not. They clearly thought I was some sort of public servant whose facilities they could just wantonly make use of. The things you see when you DO have a gun! I intended to stay away two nights, perhaps three, but I am home after one. Such is the penalty for increasing deafness. When I called Della on the sat phone I was surprised she expected me home after only one night, but I thought something must have come up she did not want to mention on the phone, or… anyway her wish is my command – only it wasn’t evidently. I will stay a little longer another time. I have another more remote spot I often go which takes me 3-4 days each way to get to/from & which I haven’t yet visited this year. Winter is the ideal time for camping out; if I appear to disappear for a week or so, you will know I have heard the mountains’ call once more.